VIDEO: Is Opening Night always rained out? 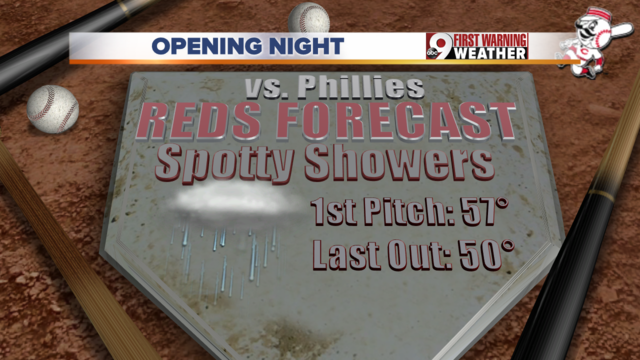 Reds fans, we made it through Opening Day with no rain and great weather. But will we be so lucky for Opening Night? It doesn't look like Mother Nature will be playing ball Wednesday evening. And this will be the 3rd year in a row for rain on Opening Night. Wednesday will start dry and temperatures will be warmer, in the upper 50s. At least temperatures will be similar to what we had back on Monday. Isolated rain showers will be possible between lunch and 4 p.m. 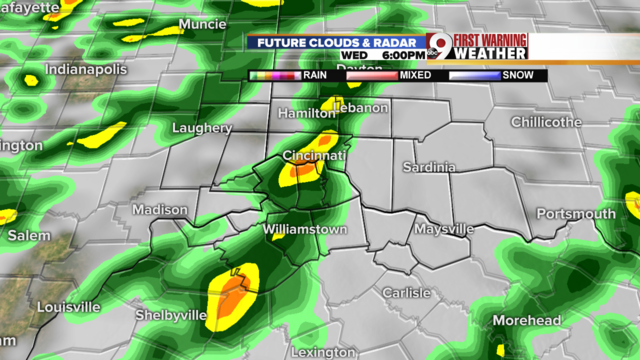 But after 5 p.m., a cold front moves into the Tri-State, bringing in better chances for showers. Better rain chance after 5 p.m. This spotty rain chance will be around from 5-11 p.m., which cover the entire timeframe for the game. Rain delays will be possible during the game. We could also see a few lightning strikes, which is never a good thing at an outdoor event with thousands of people in attendance. As always, we are always looking for the positive. It shouldn't rain for the entire game. This will come in waves which means we will have some dry moments. And temperatures will start at 57 degrees and fall to 50 degrees so it's not terribly cold. Have fun Wednesday evening and dress for the rain!